how do you choose the right vein treatment? 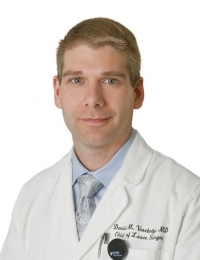 » Watch Next Video by David Verebelyi, MD - Are varicose veins more than a cosmetic issue? How do you choose the right vein treatment? The right vein treatment is wisely determined by what the cause of your veins is. In most cases, we have to find this out by doing an ultrasound. An ultrasound is used to scan the venous system to see where the problem is. In many cases, our patients would come in with very tiny veins on the leg. But unfortunately, the problem is much deeper in the vascular system. Once we figure out what the problem is, then we can determine what the proper treatment is. There are usually three levels of treatment. On the first level, the very superficial tiny veins, these are veins that are less than one millimeter. Normally, they are dark purple or dark red - pulse dye laser is the treatment of choice. Two to three sessions are normally enough to clean these little vessels up. It does not normally take longer than about 15 or 20 minutes. Best of all, back to your feet on the same day. If the problem is a little bit deeper, and we are talking about reticular veins, these are vessels that are about one to three millimeters. Normally, light green or light blue in color. Sclerotherapy is definitely the treatment of choice. In this case we use the injectable inside the vein to sclerose it. Two to three treatments work very well and are very cost effective. Unfortunately, if the problem is a little bit deeper, and the valves in the veins are not working correctly, we tend to see varicose veins. These are vessels that bulge out and cause symptoms like aching and pain and restless leg syndrome. When patients have this problem, a little bit deeper procedure is needed. What we do is we actually take a very small laser, only about half a millimeter. We place it inside the vein. We use that laser to actually sclerose the vessel inside out. The best part about it is that patients are back to their feet on the same day, and insurance companies normally cover the procedure.